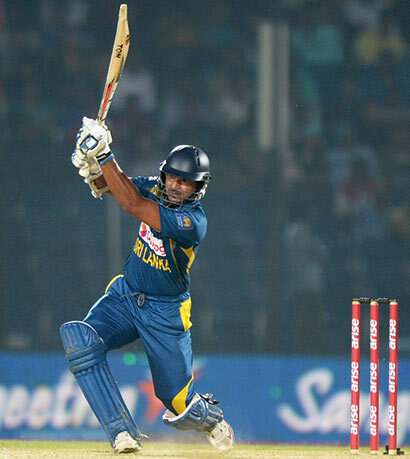 Kumar Sangakkara engineered an under-pressure 83-ball century, the quickest of his ODI career, to steer Sri Lanka to their second straight win and to the brink of a place in the Asia Cup finals. After India had posted what seemed an insufficient total, Ravindra Jadeja and the other spinners sparked an unlikely comeback midway through the Sri Lankan chase, but with Sangakkara making light of a tricky surface, India were never really favourites. India’s age-old problems with death bowling were exacerbated by the dew, and Sangakkara captialised on a series of full tosses and seemingly put India beyond the game, caning 32 off three overs to boil it down to 12 off the final two overs. When Shikhar Dhawan misfielded in the 49th over at deep square leg after another full toss, it brought up Sangakkara’s 18th ODI century and victory seemed a formality. Sangakkara allowed himself a fist pump to mark the milestone. Yet another full toss spiced up the game, though, as Sangakkara miscued a waist-high delivery from Mohammed Shami to leave Thisara Perera and Ajantha Mendis needing seven off nine deliveries. There was more low-quality cricket in the finale, as Ajantha Mendis levelled the scores with a thick outside edge past the keeper for four. With one needed in the final over, and two wickets in hand, Thisara chipped the first ball to Dhawan at mid-off, and was delighted to see a straightforward chance put down. A panicky single followed on the next delivery to finally confirm Sri Lanka’s win. Such anxious moments weren’t on the cards when Sri Lanka’s openers began brightly and with starkly contrasting styles – Kusal Perera all brute force with an everything-must-go mindset and Lahiru Thirmanne more of an old-fashioned stylist, thriving on precision strokes. They put on 80 before R Ashwin, switching between his new-fangled Narine-style action and his conventional one, had Thirimanne lbw for 38. That only brought together Kusal and Sangakkara, who coolly put together a half-century stand. The score was 141 for 2 when Dinesh Karthik failed to take off the bails on the first attempt after a leg-side take to reprieve Sangakkara. It was a miss, but with Sri Lanka coasting, and India looking listless, it didn’t seem like it would matter much. Instead, Mahela Jayawardene chipped a catch straight to extra cover, and Jadeja produced a ripping turner next ball to knock back Dinesh Chandimal’s off stump and hand him a golden duck. With the spinners, including part-timer Rohit, finding some rhythm, the middle-order collapsed, but Sangakkara remained immoveable, placing the ball perfectly and rarely needing to slog as he orchestrated the chase. India’s middle-order had floundered against the spinners as well, its first serious test in the absence of vastly experienced trio of MS Dhoni, Suresh Raina and Yuvraj Singh. The stutter came after India’s best phase of the innings, with Virat Kohli and Shikhar Dhawan putting on 97 for the second wicket on a surface where the ball was staying low and not coming easily onto the bat. Dhawan was uncharacteristically subdued, hitting only seven fours and a six in his 94 – far fewer boundaries than you would expect from a naturally aggressive batsman. The stand was broken by Mendis, who continued his love affair with the Asia Cup by grabbing four wickets to take his tally to 21 at an average of 9.76 in six matches. It was his zipping carrom ball that sent back India’s best batsman Kohli for 48, and later Dhawan for 94 in the 40th over, just as India were getting set for a final onslaught. Ajinkya Rahane had plenty of time to get his eye in, but holed out for 22 attempting his favourite shot, the loft over extra cover. Dhawan’s exit put the responsibility on Ambati Rayudu and Karthik, neither of whom are certainties in the XI, had to shepherd the team in the final ten. Both fluffed it: Karthik lasting only three balls as he miscued to mid-off, and Rayudu picking out the man at long-off as he chipped Chaturanga de Silva. Sri Lanka backed up the bowlers with some top fielding, throwing themselves around in the deep to make several sliding stops and also hitting the stumps several times from close-in. Lasith Malinga fired in his yorkers towards the death, and though a couple of mighty hits from No. 11 Shami took India to 264, it ultimately wasn’t enough in the face of a Sangakkara masterclass. The result also added more pressure on India ahead of the marquee clash against Pakistan on Sunday.